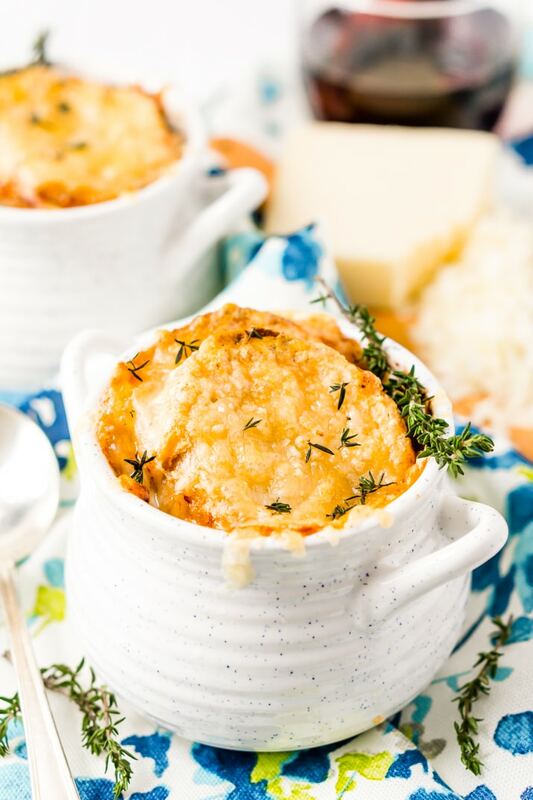 French Onion Soup is a classic dish made with caramelized onions, beef broth, and spices. Topped with crusty French Bread and a layer of melted Gruyère cheese, it’s sophisticated enough for a dinner party but comforting enough for a cozy night in! 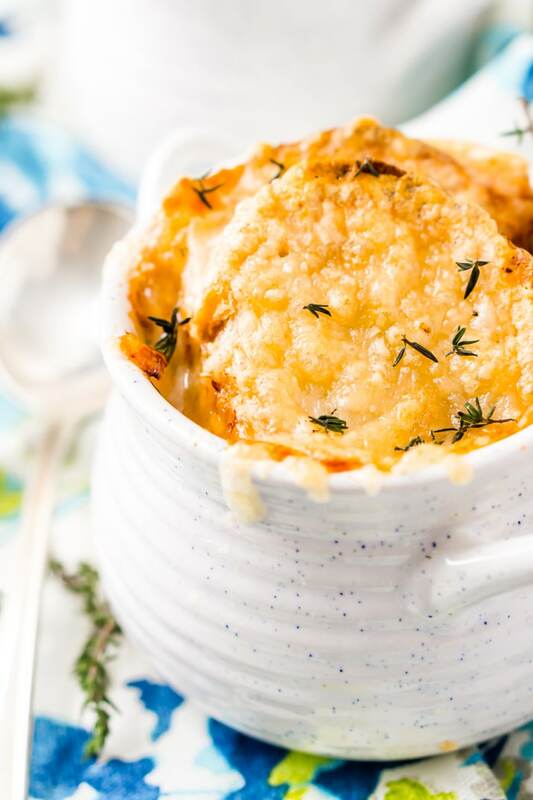 This recipe for French Onion Soup is definitely one you’ll want to keep on hand as we face the last few weeks of wind and snow before spring arrives. This soup is full of cozy flavors of caramelized onions, beef broth, and zesty spices. Not to mention, each steaming bowlful is topped with a piece of crusty French bread and a layer of creamy, melty Gruyère cheese. Either paired with a sandwich or as a meal all its own, French Onion Soup is so good! I used to only order this soup when I was out at restaurants until I learned how easy it was to make at home. The flavors are simple but have so much depth when they come together, and beef broth gives this dish its rich base and dark color. Plus, when I make it at home, there’s always enough for leftovers. I’d even argue that this soup tastes best a day or two after it’s made and the flavors have set. With a fresh slice of bubbly French bread and some Gruyère cheese melted on top, French Onion soup is like a bowlful of comfort when the snow is falling and the winds are whipping outside. If you really want a treat, try pairing it with a crispy golden grilled cheese (bonus points if you add bacon!). You won’t be disappointed! 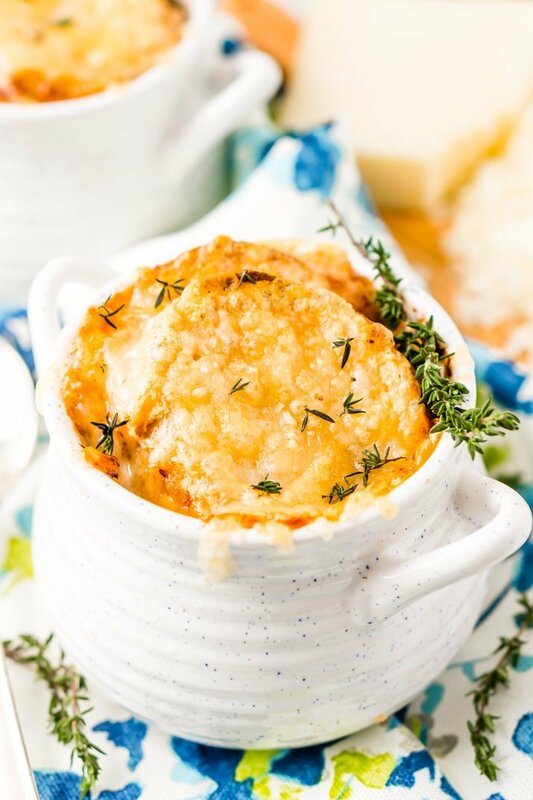 You may know that I usually share “versatile” recipes that can be used for different occasions, and this French Onion Soup recipe is no exception. We all lead busy lives, so what’s the point in sharing complicated recipes that you’ll only make once or twice a year? This dish is sophisticated enough to serve at a dinner party or small get-together, but it’s easy enough to make and enjoy on a weeknight with the family… and as leftovers for days after! Look, guys, we’re in for several more weeks of winter (at least here in New England), so we might as well enjoy it as best as we can! If you’re going to be hunkered down and curled up in blankets, you’re going to need something cozy to eat, too. 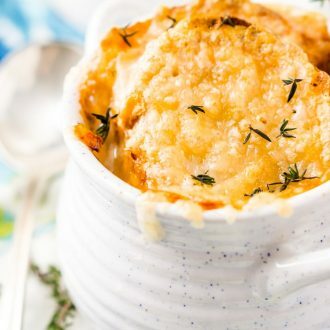 Whip up a steaming pot of French Onion Soup to enjoy in the coming chilly days, and it’ll thaw you from the inside out. 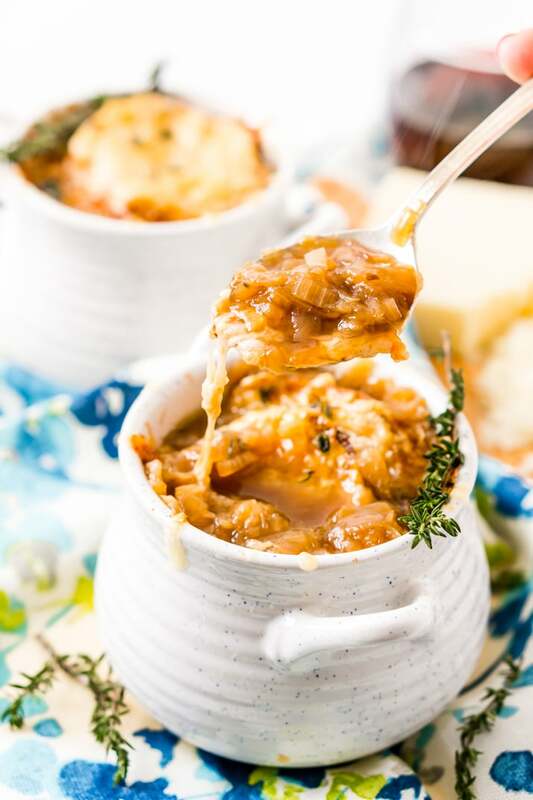 French Onion Soup is actually really easy to make even though it takes about 2 1/2 hours to make, this is all mostly simmer and stir time while the onions cook down into the flavorful and tender star of this dish! You’ll start by heating 2 tablespoons of oil and the butter in a large pot over medium heat until the butter has melted. And then add the onions and shallots and stir to coat with oil and butter. Then, cooking for about 15 minutes, stirring occasionally. After 15 minutes, reduce the heat to medium-low and cook for another 40 minutes, stirring regularly until the onions are a deep golden brown and add the garlic and cook for another 3 minutes. Next, you’ll pour in the wine and bring the mixture to a boil, cook until the liquid is reduced by half. Then add the thyme, beef broth, salt, and pepper and return to a boil. Reduce the heat to low and simmer for 1 hour, stirring occasionally. At 15 minutes before the soup is ready, you’ll need to preheat the oven to 400 degrees F and arrange the baguette slices on a large baking sheet and brush with the remaining olive oil. Toast the baguette slices for 4 minutes on each side. Finally, you’ll add two baguette slices each into 12 ramekins and ladle the soup over them and then sprinkle them with cheese. Broil under low for about 2 to 3 minutes until the cheese is melted. Make sure to watch them while they broil to ensure they do not burn. Pin this Soup Recipe for Later! 8-quart Pot – You’ll want a large dutch oven or pot to make this in, this one is the one I use. Ladle – When it comes to soup, you definitely want a ladle to scoop it out of the pot and into the bowl. Measuring Cups – This is my favorite measuring cup set, they pack away easily, are dishwasher safe, and have a grip on the bottom. Kitchen Knives – These are the best kitchen knives I’ve ever had and worth every penny, I love that they are self-sharpening because this means they are never dull! In an 8-quart pot, heat 2 tablespoons of oil and the butter over medium heat until the butter has melted. Add the onions and shallots and stir to coat with oil and butter. Cook for about 15 minutes, stirring occasionally. After 15 minutes, reduce the heat to medium-low and cook for another 40 minutes, stirring regularly until the onions are a deep golden brown. Add the garlic and cook for another 3 minutes. Pour in the wine and bring the mixture to a boil, cook until the liquid is reduced by half. Add the thyme, beef broth, salt, and pepper and return to a boil. Reduce the heat to low and simmer for 1 hour, stirring occasionally. About 15 minutes before the soup is ready, preheat the oven to 400 degrees F and arrange the baguette slices on a large baking sheet and brush with the remaining olive oil. Toast for 4 minutes on each side. Add two baguette slices each into 12 ramekins and ladle the soup over them and then sprinkle them with cheese. Broil under low for about 2 to 3 minutes until the cheese is melted. Watch them while they broil to ensure they do not burn. The onions should equate to about 3 lbs total in weight, add additional onion if necessary to meet weight. If not making for a large group, follow the steps for as many as you need and reserve the soup in the post for leftovers later on. A vegetable broth could be used instead of beef if you wanted to make this recipe vegetarian. There is NOTHING I love more than a bowl of French onion soup on a cold day! How is it possible that there’s so much flavor in such a simple recipe? And definitely gotta have that cheesy toast top – YUM! Right, it has such a small amount of ingredients for the amount of flavor it packs! Onions are king when it comes to flavor! 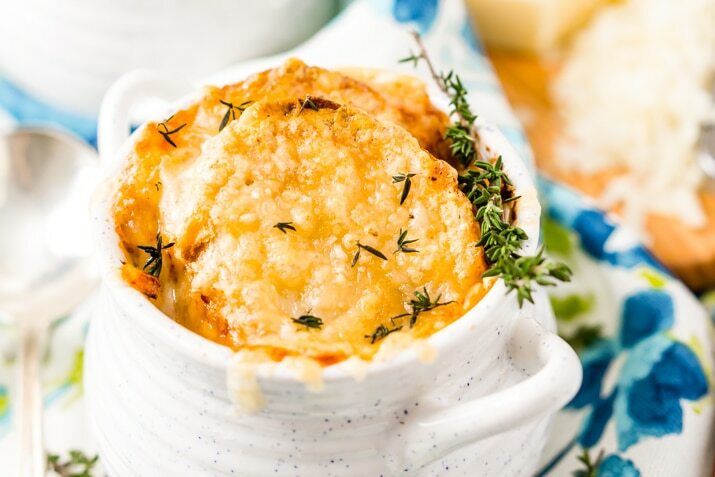 This has to be the perfect french onion soup! It looks phenomenal! I have never had chunky soup with beef in it before. This looks so delicious. The perfect hearty dish for the weekend! I am so eager to try this, but can I substitute the French baguette with bread pieces or buns? Hi there, there’s no beef in the actual recipe, just beef broth. You can use other pieces of bread if that’s all you have!